2 types of calibres is used in this sport (.22 cartridges & .38 cartridges). 25 meter rapid fire pistol is one of the ISSF shooting events. The event has been a part of the Olympic program ever since the beginning in 1896, although its rules changed greatly before World War II, after which they were only slightly changed until the two major revisions of 1989 and 2005. The latter restricted the event to sport pistols, thereby banning .22 Short cartridges as well as encircling grips and low trigger-pull weight. This caused a decline in results: the pre-2005 world record was 597, while the present world record is 592. 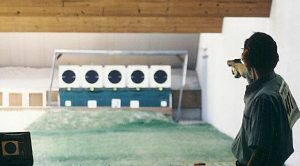 25 meter standard pistol is one of the ISSF shooting events, introduced at the ISSF World Shooting Championships in 1970. It has its roots in the NRA conventional pistol competitions. The standard pistol match is shot with a regular sport pistol (also called a standard pistol) in caliber .22 LR. 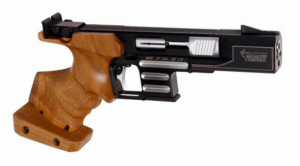 As with all ISSF pistol disciplines, all firing must be done with one hand, unsupported. 25 meter pistol, formerly and unofficially still often known as sport pistol., is one of the ISSF shooting events. It was devised as a women’s event in the 1960s, based upon the rules of 25 meter center-fire pistol but shot with a .22 caliber sport pistol instead of the larger-caliber guns men used. 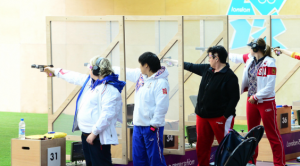 As with all ISSF pistol disciplines, all firing must be done with one hand, unsupported. 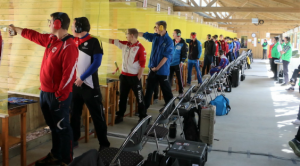 25 meter center fire pistol is one of the ISSF shooting events, and is normally a men only event. Its origin lies in competitions with military-style service pistols, and as such its history dates back to the 19th century.